Make sure to set up a stable internet environment before starting any session. Make sure you review our mentor guidelines here. Miss or be late to your scheduled sessions. Use unstable internet connection, such as your mobile phone's internet as a connection tool, during your sessions. Ask or solicit clients to pay you through Third-Party Platforms. If our system detects this sort of behavior, you will be banned. 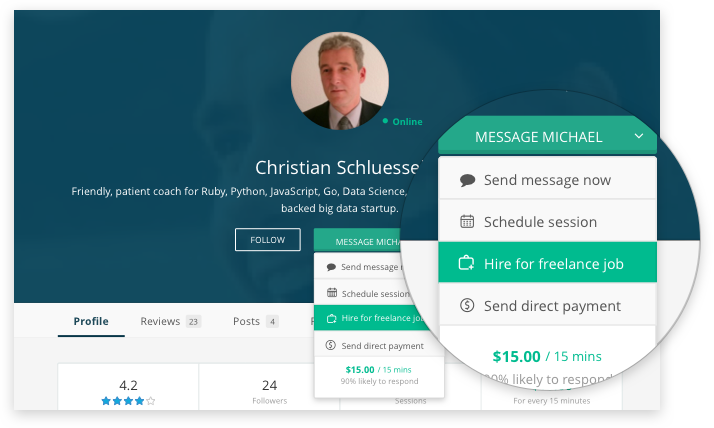 Instead, users can pay you for freelance jobs or send you direct payment via your profile or the chat window, as shown below. For more information, please refer to our Terms of Service.